A 20-story residential condominium building with 35 units is planned for 230 West 78th Street between Broadway and Amsterdam Avenue by Amsterdam 78, LLC, in care of Urban Residential LLC at 599 Broadway. An offering plan was filed with the New York State Attorney General’s office April 27, 2006 with a total offering price of $109,525,000. The offering plan did not provide many details about the proposed new building but it indicated that part of it would be cantilevered at the 4th and 6th floors. The building would have 75 feet frontage on 78th Street. The building would have bicycle storage, a fitness center, an attended lobby and a roof deck. A four-bedroom apartment with three-and-a-half baths on the 18th floor with 3,156 square feet of space plus 611 square feet of terrace is priced at $6,950,000. A one-bedroom, one-bath unit with 949 square feet is priced at $975,000. The site is presently occupied by a four-story building with an 11-step stoop entrance and a rusticated stone facade. [B][SIZE="4"]The site is presently occupied by a four-story building with an 11-step stoop entrance and a rusticated stone facade. This is one to save. Due to a zig and a zag in the district boundary this building is not governed by Landmark regulations. But no doubt lots of neighbors will fight it. It's one thing to put a 20 story building up on the north <> south avenues, but mid-block is WRONG. I don't like the sounds of this one, it sounds like it will be a sliver building on a low-rise side-street. That said I dont want to hear any crude sexual references and a call for the developers head and the death of his family. Infractions will be given if the forum rules are not followed. That said please discuss the development at hand in a mature and intelligent manner. Last edited by NoyokA; November 6th, 2006 at 09:24 PM. It seems that I mis-wrote above ... this site appears to be on the SOUTH side of W. 78th. DOB shows an Application for a "NB" (New Building) at 230 W. 78th was "pre-filed" on 9.20.2006. The Application is specifically for "Construction Equipment: FENCE"
No Architect of Record is listed. No Applications for Demo / Construction have been submitted as of yet. That sounds like three building sites. Next door to the west at 232-234 is a double lot (DOB says it is a Church / Synagogue). May we kindly request that the intelligence-challenged developer be run out of town on a rail? This one definitely does not sound good.....and I'm shocked that all of the buildings in that photo aren't landmarked. Handel architects are mentioned in the article, a group which is actually better than average, but still, 20 stories plus cantilevering sounds terrible for this location. i keep looking at the picture and it boggles my mind that anyone would want to raze that building. even by the rules of the market, dollar for dollar (i.e. the actual ROI), wouldn't it be a better deal to renovate it and sell it as a townhouse, at that location? anyone know the numbers for that area/ property? I sent this article to "Landmarks West!" Although I will admit that I have strongly disagreed with them in the past about being too anti-development, I just thought it would be the right thing to do to alert them of this if they were not aware. There are plenty of places in NYC where this development would be welcome. A mid-block on the UWS should not be one of them. A four-bedroom apartment with three-and-a-half baths on the 18th floor with 3,156 square feet of space plus 611 square feet of terrace is priced at $6,950,000. A one-bedroom, one-bath unit with 949 square feet is priced at $975,000. If every unit other than the PH were sold at the low number shown above (not likely) that comes to 34 units x $975K / unit = $33,150,000 + ~ $7M for the PH = ~ $40M Total. A townhouse sale wouldn't reach anywhere near that level. It seems that air rights are involved here. With the description in the article of the cantilever at the 4th & 6th Floors my guess is that the building will rise on the single lot at 230 (with a 25 foot frontage) -- that none of the neighboring structures will come down -- and the sale of air rights would allow for the cantilever over the buildings to the east and west. It could be that this is all a done deal and is being built "as of right"
Zoning MAP (pdf) seems to show that this lot is in a C4-6A zone. Zoning TEXT (pdf -- Page 4) says that "Bulk Regulations" for such a Zone is equal to Regs for Residential "R10". Moderate- and higher-density residence districts are generally found close to central and regional business districts, and are usually well served by mass transit. These areas are characterized by bulkier buildings, a wider range of building heights and lower auto ownership than lower-density areas. Like the lower-density residence districts, however, the character of these neighborhoods varies widely. 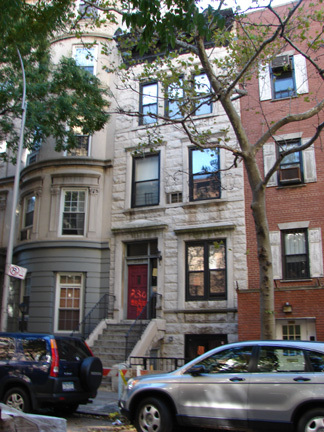 Some are defined entirely by row houses, others by low apartment houses or high-rise buildings and still others by a mixture of all building types. Moderate- and higher-density districts are divided into two categories: non-contextual and contextual. Non-contextual districts (R6, R7, R8 and R9), sometimes called height factor districts, are generally mapped where there is a mixture of building types and no predominant context. Contextual districts are those districts with an A, B or X letter suffix (R6A, R6B, R7A, R7B, R7X, R8A, R8B, R8X, R9A, R9X, R10A and R10X). Contextual districts, where development must comply with the regulations of the Quality Housing Program, are designed to maintain the scale and form of the city’s traditional moderate- and higher-density neighborhoods. These districts are mapped where buildings of similar size and shape form a strong neighborhood context or where redevelopment would create a uniform context. In non-contextual R6 through R9 districts, developers have a choice between building under height factor or Quality Housing regulations. In non-contextual R9 and R10 districts, developers may also elect to build pursuant to the tower regulations. R9 and R10 districts without a letter suffix, as well as commercial districts permitting equivalent residential density—all mapped mainly in Manhattan—allow residential towers of up to 35 stories above a contextual building base of between five and eight stories. The building form is called a tower-on-a-base. A residential tower that rises straight up without a contextual base may also be allowed, if it is located in certain high-density commercial districts or on a narrow street in an R9 or R10 district. See, this is what I'm talking about when I say: evaluate a proposal according to its specific site. Since this particular one isn't within the landmarked district, you can't use the blanket argument of "it's inappropriate for the area." What I'm hearing, for the most part, is what makes sense: surrounded by low townhouses, quiet side street, better go on one of the avenues. Inappropriate building for its site. The cantilevering will doubtless be awkward, too. Verdict: this one's a no-go. Inappropriate building for its site. The cantilevering will doubtless be awkward, too. I am curious to see if anyone on this board shares a different opinion than the one you present. I sure fully agree you, pianoman.